David Lowenthal. George Perkins Marsh: Prophet of Conservation. University of Washington Press, 2015. George Perkins Marsh (1801-1882) was the first to reveal the menace of environmental misuse, to explain its causes, and to prescribe reforms. David Lowenthal here offers fresh insights, from new sources, into Marsh’s career and shows his relevance today, in a book which has its roots in but wholly supersedes Lowenthal’s earlier biography George Perkins Marsh: Versatile Vermonter (1958). Marsh’s devotion to the repair of nature, to the concerns of working people, to women’s rights, and to historical stewardship resonate more than ever. His Vermont birthplace is now a national park chronicling American conservation, and the crusade he launched is now global. Marsh’s seminal book Man and Nature is famed for its ecological acumen. The clue to its inception lies in Marsh’s many-sided engagement in the life of his time. The broadest scholar of his day, he was an acclaimed linguist, lawyer, congressman, and renowned diplomat who served 25 years as U.S. envoy to Turkey and to Italy. He helped found and guide the Smithsonian Institution, shaped the Washington Monument, penned potent tracts on fisheries and on irrigation, spearheaded public science, art, and architecture. He wrote on camels and corporate corruption, Icelandic grammar and Alpine glaciers. His pungent and provocative letters illuminate life on both sides of the Atlantic. Like Darwin’s Origin of Species, Marsh’s Man and Nature marked the inception of a truly modern way of looking at the world, of taking care lest we irreversibly degrade the fabric of humanized nature we are bound to manage. Marsh’s ominous warnings inspired reforestation, watershed management, soil conservation, and nature protection in his day and ours. 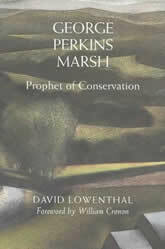 George Perkins Marsh: Prophet of Conservation was awarded the Association for American Geographers’ 2000 J. B. Jackson Prize. The book was also on the shortlist for the first British Academy Book Prize, awarded in December 2001.